New lis pendens filings in Tallahassee did not change in September when compared to September 2013, and it marks the first time in 3 months that new filings did not rise. Foreclosures rose significantly however, up 85% when comparing the same time periods. The recent trend of growth in lis pendens unfortunately has us concerned, as it could possibly mean that there is still a long way to go before we move the distressed properties through the market. The growth in foreclosure sales is not alarming, as it was expected. The best way to understand the relationship between lis pendens and foreclosure sales is smoke and fire. As they say, where there is smoke, there is fire! We've been seeing a lot of smoke (lis pendens filings), so when reports of fire come in (foreclosure sales), we were prepared. The large amount of lis pendens filed in the past must clear the market now as foreclosures before we can really enjoy stabilization. In the real estate graph below, each vertical bar measures 365 days worth of information (thus demonstrating a one-year trend each month). 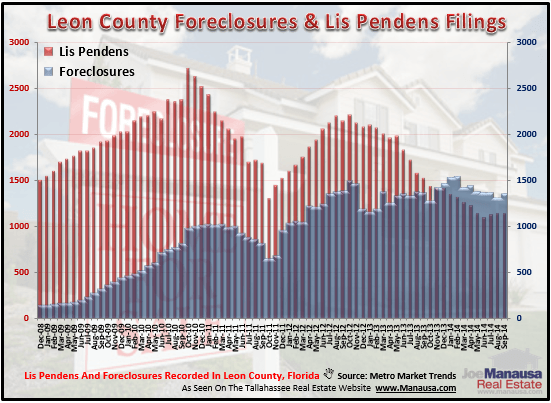 The red bars measure new lis pendens filings, while the blue bars measure foreclosure sales. The fact that foreclosure sales are becoming more prominent than lis pendens filings suggests that the market is healing. The following list shows the actual lis pendens filed during the month of September.